It’s beginning to look a lot like Christmas! We are feeling very festive at our Buckinghamshire showroom, home of the brands; Green Retreats, The Garden Office and Garden Studio. Request a free site visit from the My Eco Space team, they will bring with them the kit for you to take a live virtual tour of one of their garden rooms. Green Retreats have a large indoor showroom where you can view several different styles of garden room. It’s well worth a visit as part of your garden room research. Green Retreats have launched a cool virtual tour of their extensive show site. You can really look around the different designs and go in each building and get a feel for it. With the long Easter holiday approaching now is an ideal time to contact the suppliers and arrange to see their work. We’ve made it easy for you to find out about suppliers show buildings. Garden Spaces one of the industries biggest success stories is exhibiting at the PSP Southampton Boat Show, where they will be showcasing new exterior finishes and glazing options which fuse indoor / outdoor living. Yesterday we published an image of Garden Spaces finishing off their show building at Grand Designs Live, well a day on and the building is finished, furnished and the show is open. 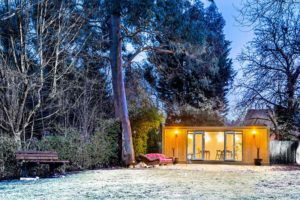 Websites and glossy brochures are great for giving you information on the different styles of garden studios and how they’re built, but you can’t beat actually seeing a building before you buy. Visiting a show site or a trade show gives you an opportunity to see the types of materials used and to examine the quality of workmanship, it also gives you the chance to get the feel of a building, judge the size and experience what it will be like to spend time in. Many companies exhibit at home and garden shows such as the RHS Chelsea Flower Show or Grand Designs Live and this is a valuable opportunity to speak directly to the people who build the studios. 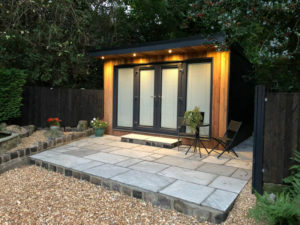 Some companies have arrangements with previous customers for you to visit their buildings, this is normally by appointment but offers the opportunity to speak to people who have actually brought and used a garden studio.